Here, we explain where to go once you have got your first project up and running using the Shotgun Desktop. It covers useful common questions and topics and lists useful documentation resources. Please note that this document describes functionality only available if you have taken control over a Toolkit configuration. For details, see the Shotgun Integrations User Guide. Welcome to Toolkit! If you are reading this, it probably means that you have managed to successfully install your first Shotgun Pipeline Toolkit Project using the Shotgun Desktop. At this stage, we are hoping you are up and running and have something looking like the screenshot above, a project page with several application launchers. At this stage, try opening Maya, Nuke or any of the other Applications. 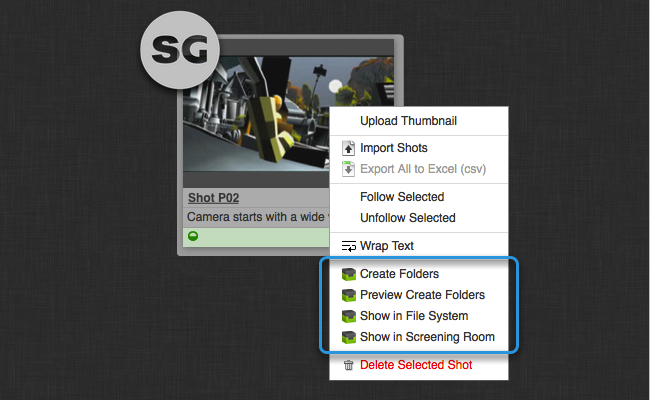 You should find a Shotgun menu with further functionality for managing files and assets. So where do you go from here? Toolkit offers a lot of flexibility in terms of its configuration and how it works. This document tries to cover some of the next steps that we recommend that you carry out once you are up and running with your first project using the Shotgun Desktop. This section contains a collection of tweaks and useful things to configure. If you have just set up your very first Toolkit project, there are most likely a number of little tweaks and adjustments you need to do to get everything up and running properly. This section tries to explain these various steps. Please note that some of these things involve editing configuration files and going "under the hood" at the moment. 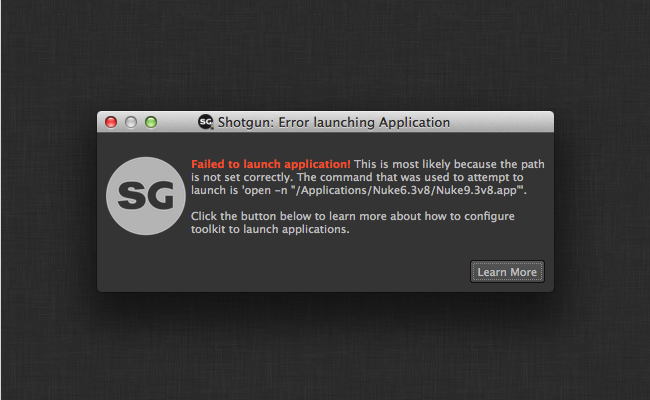 If you have any questions about anything, don't heistate to reach out to our support on support@shotgunsoftware.com! 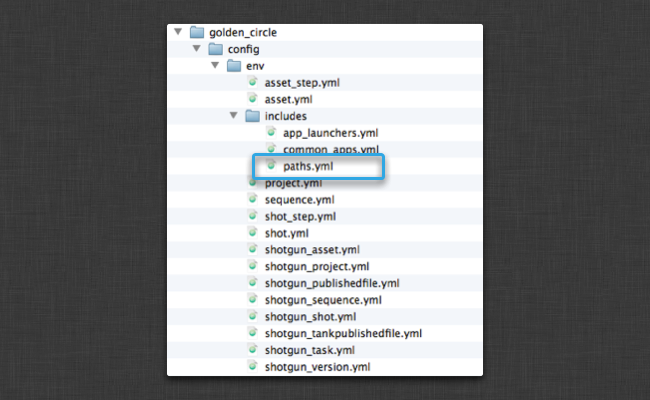 In the toolkit project configuration, we store paths to the various executables that you can launch. If you are seeing the above message, it probably means that those paths are not matching your studio setup. You may also find that the wrong version of the application is being launched; for example, our default configuration may have a path to maya 2015 but your studio is running maya 2014. In this case, you also need to change the paths. Open this file and make the necessary changes to the paths. 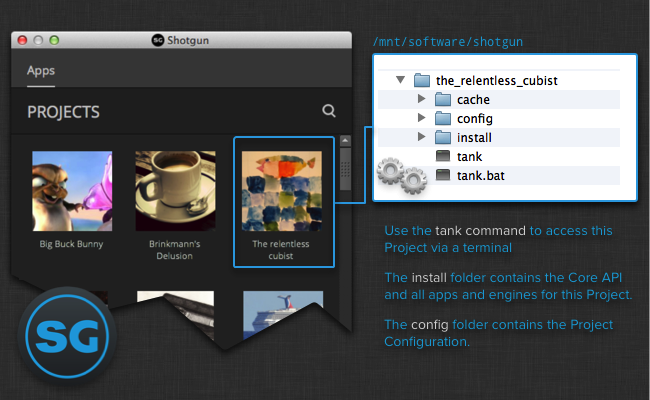 Once you have saved the file, you need to leave the project inside of Shotgun desktop and then click back into it. (but no need to restart the entire application). In some cases, you may be seeing a message popping up, informing that you Python cannot be found with a link to this section of the documentation. Use an older version of the Shotgun Desktop which doesn't set up all Python defaults automatically. If you have installed the Shotgun Desktop in a non-standard location on disk. If you a running a manual or more complex Toolkit project setup. 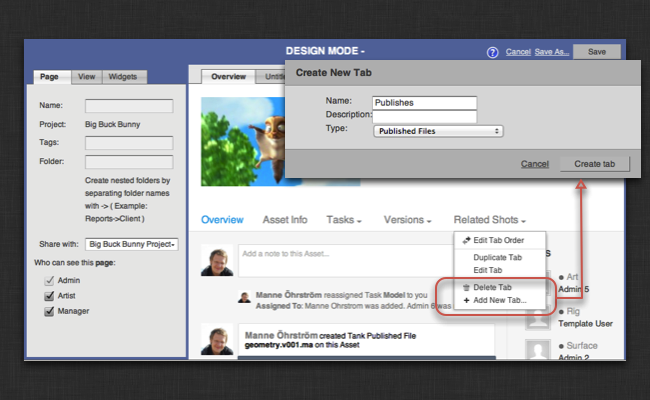 In order to find the right file, first navigate to your project configuration. In there, find the tree files starting with interpreter_. These contain the paths to the python interpreter for Linux, Windows and Mac ("Darwin"). These files contain the location of Python for each of the three operating systems. You now need to go in and manually add the python locations for any operating system you wish you use. If you rather have installed the Shotgun Desktop in a non-standard location or intend to use a custom python location, please ensure that the paths in the files point to a valid Python installation. It needs to be v2.6 or above (but not Python 3!). If you want to execute UI based applications and tools, please make sure that the Python you specify has either PyQt or PySide installed and is linked up to a QT v4.6 or higher. Please also note that in order to run Toolkit on multiple operating systems, you need to specify the paths to all your desired platforms when you are running the project setup wizard. If you haven't done this, and want to add an additional operating system to a storage path or configuration location, just drop us a line on support@shotgunsoftware.com and we'll be happy to walk through the steps. Hopefully at this point you now have the default Shotgun setup working for a Shotgun project (or test project). Applications are launching, Context menu actions and publishes are showing up in Shotgun and things are working on all your desired operating system platforms. This next section is all about what to do next -- the process of starting to take that default configuration and adjust it to work more like the rest of your studio pipeline. 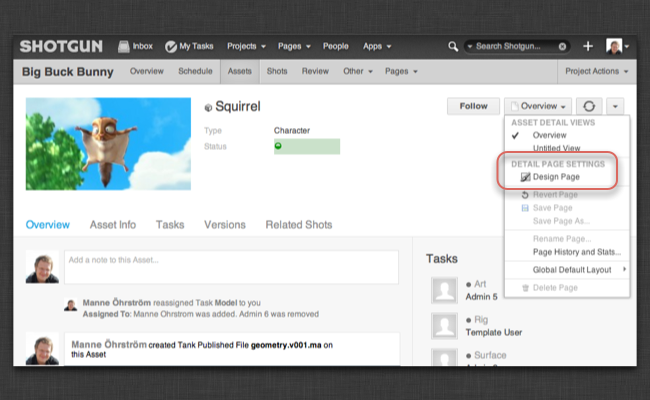 Toolkit is flexible and highly configurable, and we have lots of documentation. But before you get started, to see it all in action, we recommend spending a couple of minutes checking out our various walkthrough videos. These show the Shotgun Pipeline Toolkit in action, how it works inside applications such as Maya and Nuke. It also goes through basic concepts such as publishing, version control, loading etc. When you create a new Toolkit project, you end up with a couple of key locations. 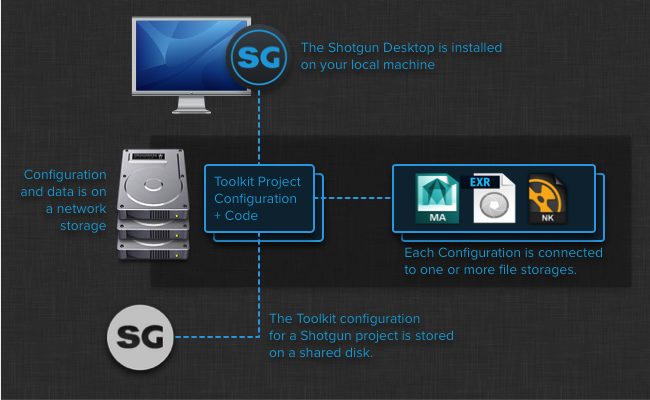 The shotgun Desktop and its configuration is installed on your local machine. (If you want, it is possible to relocate both the application and the configuration to a shared storage). The data area where the Toolkit project will store textures, files, renders etc. This is normally on a shared storage, because you want to share this data with other users, however there are exceptions to this rule; user work areas can be stored on local (user only) storage, and integrations such as our perforce integration uses an external system to help distribute content. The toolkit configuration is a fully self contained bundle, including code, apps, core API etc. This is normally stored on a shared storage so that the configuration is easily accessible by all users. Your Project configuration on disk contains a couple of different items. In the following sections we'll walk through the various parts of the project configuration folder. 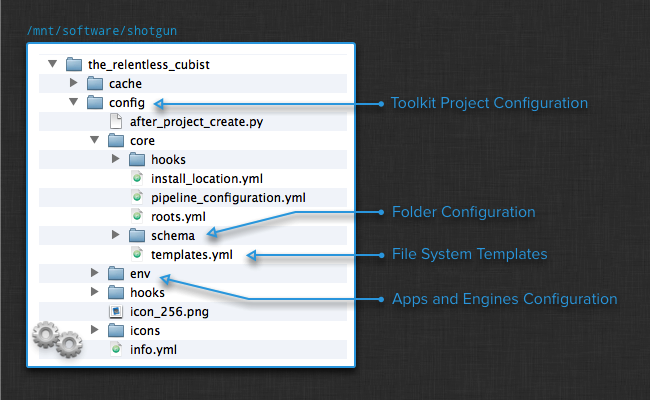 As well as using the Shotgun Desktop, you can also access Toolkit via a terminal or shell. Each project that you create on disk comes with a special tank command which gives you command line based access to a lot of functionality, including starting up an API session and launching applications. > How to administer Toolkit. The config folder contains a couple of key configuration files. Toolkit comes with a folder creation system which tries to automatically create folders on disk to make sure that when you start up an application, all the necessary structure on disk exists and has been prepared on beforehand! The configuration for this can be found in the schema folder indicated above. Hand in hand with this goes the Toolkit template system which makes it easy to define the various paths to files that you can configure; your publishes, work files, renders etc. This is stored in the templates.yml file above. A toolkit configuration is essentially made up of a collection of configured apps and engines. This configuration is located in the env folder. If the file system configuration files discussed above define where resources should be located on disk, the environment configuration with its apps and engines define what the pipeline is supposed to do. > The official Toolkit App and Engine listing. Each project configuration uses a collection of Apps and Engines. 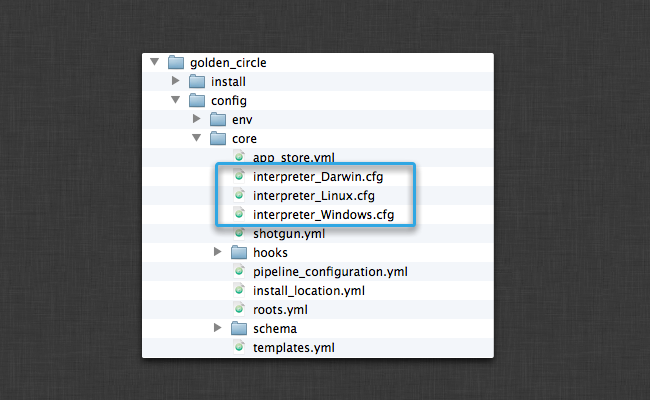 The configuration for these apps and engines are stored in the env folder inside the configuration. Toolkit will then automatically download and manage the various versions of the code needed to run these apps and engines. The code is placed inside the install folder. The configuration, apps and engines are all running on top of the Toolkit Core platform. For new projects, this is also stored inside the install folder. Essentially, a project configuration is fully self contained - all the necessary pieces required to run toolkit are in a single place. This also means that each project is independent and updating one project will not break another. Please note that if you are running a lot of projects or if you have other specific requirements, it is possible to run a single Core API which is shared between multiple projects. The benefit of this workflow is that you only need to update the Core API in one place for it to affect a series of projects. This used to be the toolkit default behaviour, and this is still how things will work if you run the tank setup_project command to set up your projects. In toolkit, we say that a project which maintains its own core API is a localized configuration. 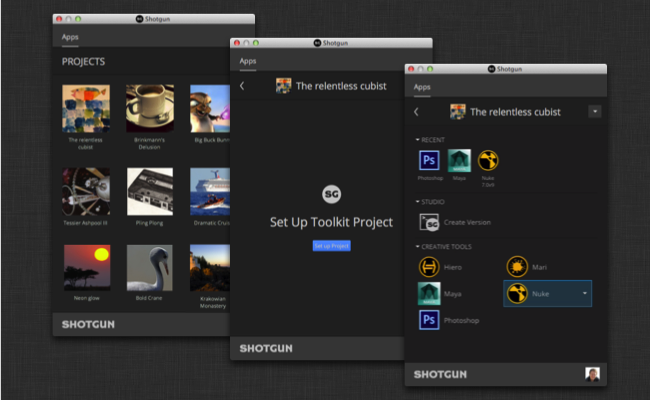 When using the Shotgun Desktop, all projects are localized by default. If you want to break out of this pattern, you can either run the tank share_core in order to move the core API out from the project configuration into an external location or alternatively tank attach_to_core to remove the interla Toolkit API from your configuration and instead attach to an existing core API. We also have a more technical document that goes through the high level concepts in the Shotgun Pipeline Toolkit and explains 'bigger picture' things. Once you have a good grasp of what Toolkit does out of the box, we recommend that you move on to this document to get a deeper undestanding of how Toolkit could be adjusted to suit your particular studio needs. A part of Toolkit is its community of pipeline engineers and TDs! We are on a mission to create a vibrant, code sharing community where we all can help evolve Toolkit together to become a powerful and flexible pipeline environment. If you have any questions, or want to read through existing posts and conversations, please visit our public forums section. Lastly, if you have any questions, ideas or concerns, never hesitate to contact us directly! We try be be practical and hands on with support and if you for example have found a bug, we can often push a bug fix update quickly to you via our app store. Just drop us a line on support@shotgunsoftware.com and we'll be happy to help!